Crimson-backed Sunbird is a small nectar-feeding bird endemic to the Western Ghats mountain ranges of India. It is also the smallest bird found in south India along with the Pale-billed Flowerpecker, which also has a similar size. Know more about this little bird below. A male Crimson-backed Sunbird perched on a thorny branch. Date – October 3, 2016, Equipment – Nikon D7100, 200-500mm f/5.6E VR. The above photos are from Salim Ali Bird Sanctuary in Thattekad, Kerala. Also, all the clicks are from the same spot and on the same day. There are plenty of flowering plants in the sanctuary where these little birds regularly visit to feed on nectar. 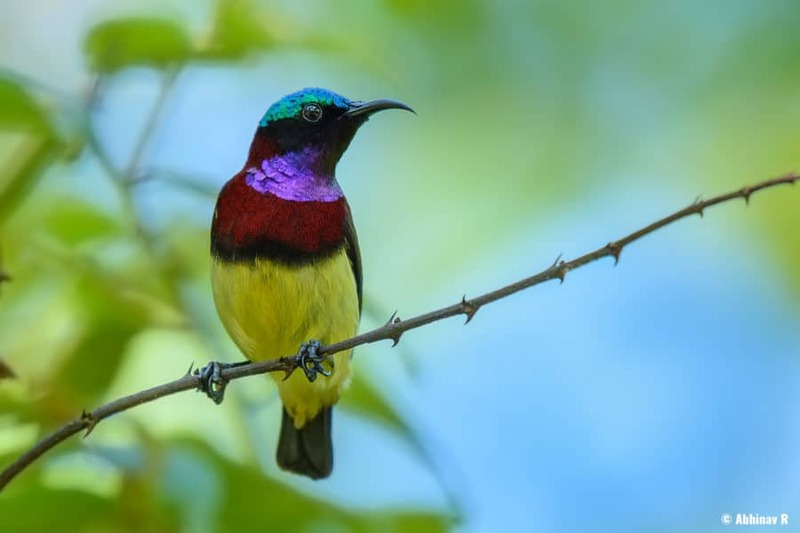 Apart from these, Purple Sunbirds and Purple-rumped Sunbirds are also found, along with different species of flowerpeckers. Here, in my observation, Crimson-backed were more in number and were easy to find than flowerpeckers. Anyway, had a great time photographing these little wonders of nature. 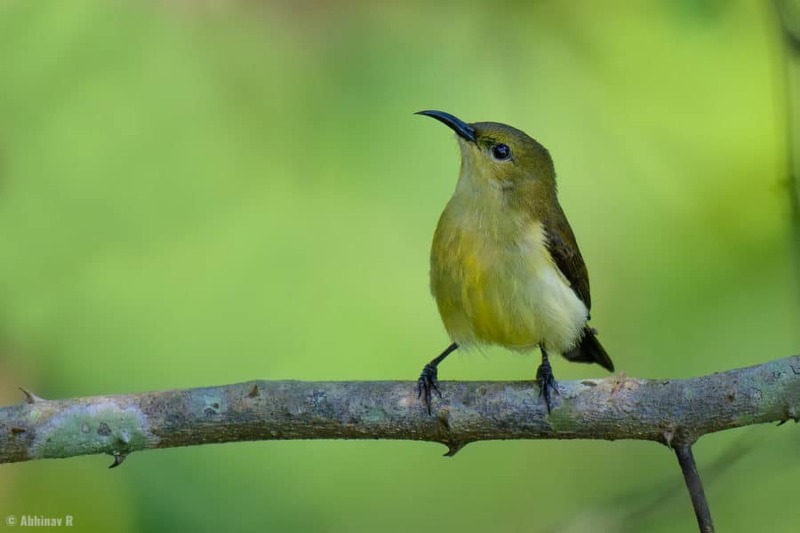 With a size of 8cm, until now, it is the smallest sunbird species found in southern India, whereas the Fire-breasted Flowerpecker found in the Himalayas and northeast is the smallest bird in the whole of India. The male and female vary in plumage, with the former having the crimson colors. Its upper side of the has crimson feathers, which extends as a breast-band to the front-side. The throat is metallic purple whereas head is shining greenish blue. The colors slightly appear different when watched from different angles and lights. The underparts are yellow in color. The female is mostly yellow with olive-green upperparts and crimson rump. L.minima smaller in size (8 cm), L.zeylonica is nearly 10 cm. L.zeylonica has white color towards the belly whereas has the other has yellow all over the abdomen region. L.zeylonica has metallic green shoulder patch which is absent on the other. L.minima has a more downcurved bill. Crimson-backed sunbird is endemic to the Western Ghats. 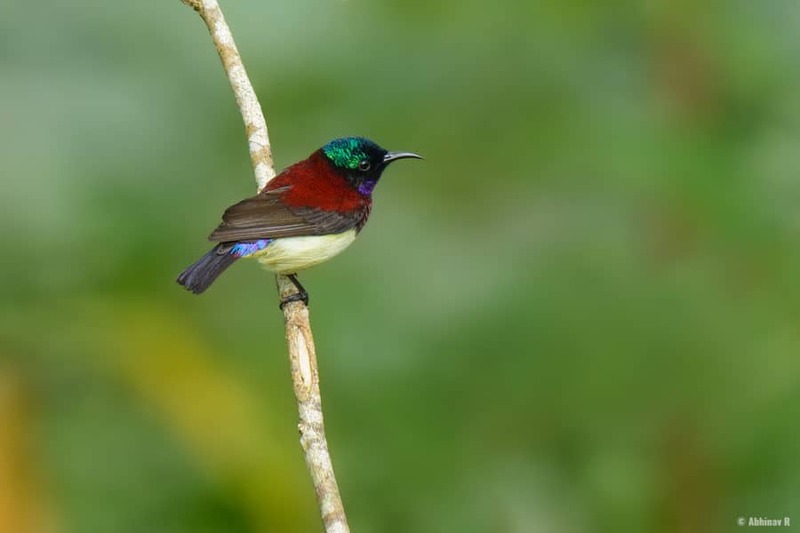 It is also the only endemic sunbird of the Western Ghats. Main habitats include areas with flowering plants near to forests, shola forests and valleys. A frequent visitor in gardens and flowering trees near forests.